South Devon is a beautiful area of the UK, filled with an abundance of hidden treasures when it comes to walking the coastal paths, offering a variety of stunning views from the bay of the English Riviera to the red cliffs of Torbay and the rolling green hills of the countryside and UNESCO World Heritage Sites and Geo Parks such as Berry Head Nature Reserve. Below, we’ve listed our top 10 coastal walks of South Devon for you to try and tackle, varying from smooth and accessible routes to more difficult routes for those wanting a challenge. This walk can be started at the photographic harbour of Torquay, in the summer months you will find a big ferris wheel which adds some seaside charm! The best walk is to follow past Living Coasts where you will find penguins and head towards Meadfoot where you will see Thatchers Rock sitting alone from the cliff edge. When you reach Babbacombe Bay, make sure to take the vintage tram down to the beach! 8) Brixham Harbour to Broadsands Beach. This walk offers lots of historical sights! Start at the Statue of William of Orange in Brixham Harbour where you will pass the replica of the Golden Hind which Sir Francis Drake sailed around the world between 1577 and 1580. You will head through Battery gardens where you can find bunkers from World War II and older, through Fishcombe & Churston coves and the woodlands to Elburry Cove, a secluded beach which boasts a charming castle on the sea edge, before climbing over green hills to the popular beach of Braidsands. Situated about 10 miles from Plymouth, Noss Mayo sits on the picturesque Yealm Estuary. If the tide is low you can also reach the neighbouring village of Newton Ferrers by walking across a small creek! This coastal walk involves the stunning countryside with views across Galmpton Beach where you will eventually end up at the historic home of Author Agatha Christie! There is loads to explore across Dartmoor, from the Ten Tors (used as part of the Duke of Edinburgh Award, rolling hills with sheep and the famous Dartmoor Pony! To quaint little English pubs to stop off for lunch. 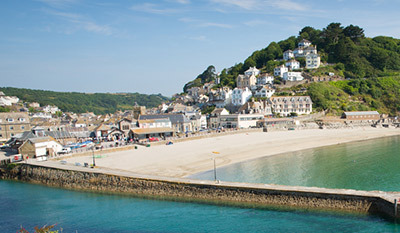 You can get to Dartmouth by many ways including driving or perhaps why not take a ferry from Brixham or Torquay to take in all the hidden coves and gems Torbay has to offer before descending by foot to Dartmouth Castle situated by the water's edge. This walk follows the coastal path along the sea wall from the seaside town of Dawlish along to Teignmouth. We wouldn't recommend this walk in stormy or windy weather! The entirety of this coastal walk covers an impressive 35 miles! We've shortened it to Cockington, an UNESCO country park that is filled with historic thatched houses and tea rooms and is well worth the visit! If you feel like exploring even further you could follow signs towards Torquay harbour or even attempt more of the Heritage Trail! This is our favourite walk and overall covers 13 miles taking you past many scenic spots such as the luxurious gardens of Coleton Fishacre and the secluded beaches of Scabbacombe Sands, Mansands and St Mary's Bay before arriving at Berry Head, another UNESCO Geological park with interesting forts from the Napoleonic War. After making this journey we recommend following the coastal path down through the woodlands to arrive at the Berry Head Hotel for a delicious Devonshire Cream Tea or Lunch or even a ice cold drink which will be a very welcome sight, we are sure! We would recommend staying the night and waking up to glorious sea views across the bay!